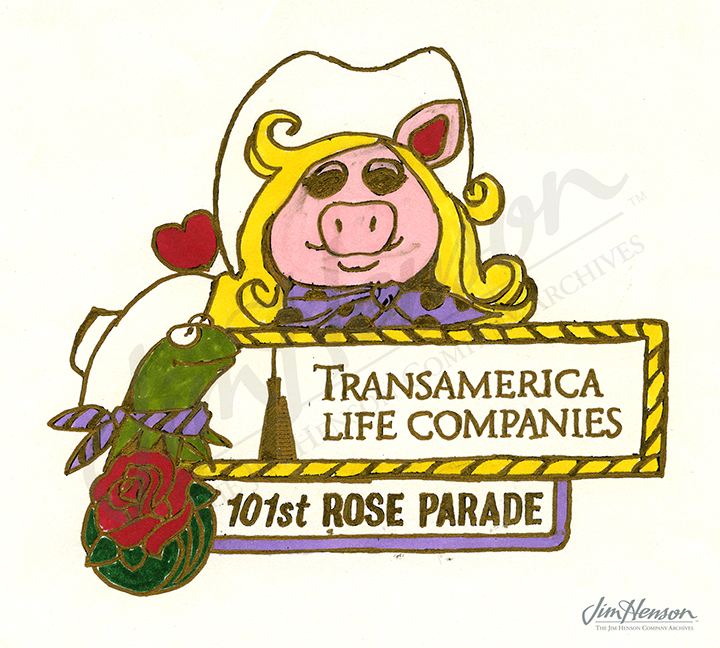 The 1986 parade featured a Rand McNally Sesame Street float, and Miss Piggy and Kermit appeared again in 1990 on a “Lassoed by Love” themed float, this time dressed in country western attire. A special collector pin designed by Michael Frith was created as a souvenir that year. The last time Kermit was connected with the Tournament of Roses Parade was in 1996 when he served as Grand Marshal, riding in the lead car. His appearance was celebrated and the Henson team received all sorts of mementos of the day: a commemorative drum head, a grand marshal ribbon, an incised crystal vase and the game coin in a presentation case. Muppet float design for the 1982 Tournament of Roses Parade. Michael Frith’s design for the 1990 Tournament of Roses Parade commemorative pin. 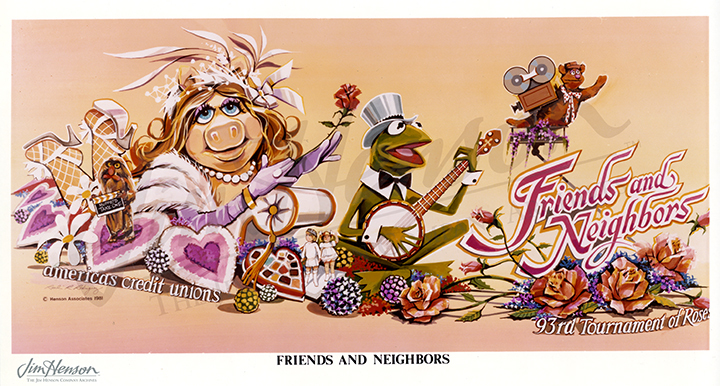 This entry was posted in 12-December '83, 1983, Appearances and tagged Brian Henson, Faye Kreinberg, Fiesta Floats, Heather Henson, Kermit the Frog, Lisa Henson, Mary Streiff, Michael Frith, Nancy Bielen, Pasadena, Richard Hunt, Rose Bowl, Tournament of Roses. Bookmark the permalink.